Uprise is a product of VisionWeb, an online company that specializes in optical dispensing, claim management, and practice management for optometrists. The company was founded as an independent company in 2000 by Essilor of America and Johnson & Johnson Vision Care. 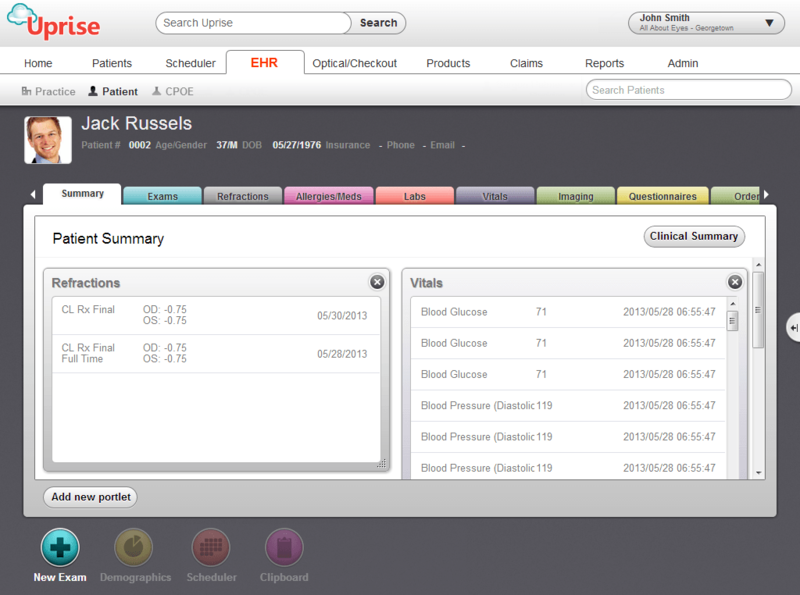 Uprise is VisionWeb’s electronic health record (EHR) offering for optometry practices. Uprise was created and optimized for use by optometrists. It provides a host of different features that support the effective management of optometry practices. Uprise provides a user-friendly platform, with dashboards, visual charts, and reporting that naturally flow to match daily usage patterns. All patient information and records are stored on individual patient profiles, so that medical history, previous visits, prescriptions, and charts can be viewed in one place. This cloud platform is mobile compatible, so users can feel free to use tablets or multiple computers around an office without sacrificing functionality. In addition, users can upload and save documents to specific patient profiles, erasing the worry that charts or reports will be lost. Scheduling appointments and procedures is done through the platform’s intuitive scheduler. Users can view the calendar with multiple different viewing options including patient information, doctor specific, time period, and even insurance information. Office hour ranges can also be set depending on individual needs and seasonality. And after appointments and procedures, patients are able to leave with prescription in hand thanks to the platform’s built-in e-prescribing function. Prescriptions can be ordered and managed in the system, and users have the option to send shipments to specific office locations, or have them shipped directly to patients. The platform also supports CPT and ICD-9 coding, and will soon support ICD-10. Optometry practices are eligible for support funding as Uprise is Meaningful Use Stage 2 certified. Uprise is a full featured and intuitive EHR platform with deep functionality for practice management. Not looking for an optometry specific platform? Check out more of the top EHR/EMR platforms with our SmartAdvisor. Learn everything you need to know about Uprise. Our experts will reach out to you shortly.